Today was a day that Texas Ranger fans and players alike have been waiting for. The debut of Japanese star pitcher, Yu Darvish. The Mariners, their plan was to treat Yu Darvish like they were facing any other pitcher. The M's got things going early in the first and wouldn't let Darvish off the hook. Darvish gave up a leadoff walk to Chone Figgins and turned around to strike out Dustin Ackley. Ichiro Suzuki blooped a single over the head of Adrian Beltre at third and Justin Smoak followed with a line drive to right field to load the bases. Kyle Seager came up next. Seager has been annihilating the ball so far this season and intended to keep doing so. Sure enough, Seager hit a 2 RBI single into center scoring Figgins and Ichiro. Michael Saunders walked, Miguel Olivo hit an RBI single and Munenori Kawasaki walked with the bases loaded for an RBI. After a Brendan Ryan strikeout, Figgins grounded out to end the inning and Darvish had already pitched 40 pitches. Mariners 4, Rangers 0. Hector Noesi had a little trouble of his own. He almost got out of trouble with a Adrian Beltre groundout that should have been a double play, but Brendan Ryan threw wide of first and Smoak had to come off the bag to make the play. The Rangers ended up scoring two runs in the inning. M's 4, Rangers 2. 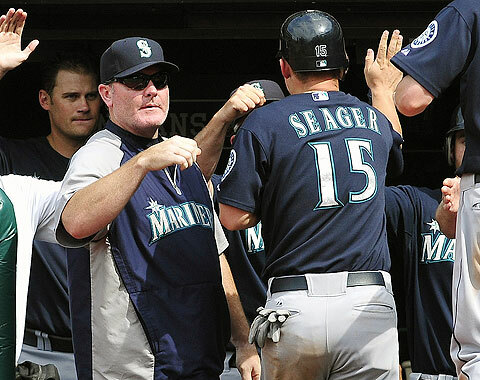 Kyle Seager made things happen in the 2nd inning as well. After an Ichiro double, he moved to third on a Smoak groundout. Kyle Seager smashed a double down the right field line, scoring Ichiro and making the score 5 - 2 Mariners. Then, all of a sudden the Rangers bats came alive and they proved why they were the American League champs. In the third, Nelson Cruz hit a 3 run homer on a line to left field to tie the game. In the fourth, Mitch Moreland hit a two run homerun that would prove to be the end for Hector Noesi who would take the loss. M's 5, Rangers 7. Erasmo Ramirez, making his MLB debut, came in and gave up a homerun to Josh Hamilton to make the score 8 - 5 Rangers, but settled down after that pitching 3 innings giving up just the solo run. Not too bad for the new kid and far better than Noesi in his 3 innings of work. George Sherrill came on in the 7th and closed out the inning, but when he came back in the 8th, it was a whole different story. Sherrill was not sharp at all, giving up a walk to Mike Napoli and a single to Mitch Moreland, he stood to face Ian Kinsler. Kinsler took a 3 - 0 pitch over the left field wall for another Texas 3 run homerun that put the game away for good and for sure. Rangers 11, M's 5. The M's couldn't get anything else going against Yu Darvish or the rest of the Rangers bullpen. Yu collected the win despite his rough start. He ended up getting into the 6th inning before being pulled with 103 pitches. The Mariners didn't have a bad game, they hit the ball well and everyone got on base at least once with the exception of Casper Wells who pinch hit in the ninth. Seager and Ichiro had multi-hit games once again and continue to swing hot bats. All in all, it was our pitching that sank the ship today. Last year it was our pitching that kept the team afloat well into June before we went on our hard to foget losing streak. Since, the Mariners have traded away much of that strength to get to some of this offense that is starting to come through. It's still way to early to count our pitching staff out, but if we can't keep the Rangers down in Arlington, we'll need to make some changes. By changes, I mean bringing up names like Danny Hultzen and Taijuan Walker. We'll see how the rest of this road trip goes, but my oh my, I'm excited about this offense.